Set in the old harbour area of St Helier and housed in historic granite warehouses, the award winning Maritime Museum is an ideal venue for a special function. The centrepiece of the Museum is the Globe Room. 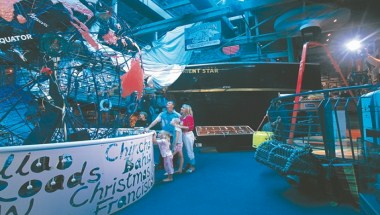 This fascinating space is filled with interactive exhibits and is an impressive and memorable venue for any function. The gallery houses 12 vibrant and emotive tapestries documenting the German occupation of Jersey. It is a popular space for presentations and tours. A presentation can be held in the Occupation Tapestry Gallery with a drinks reception to follow in the Globe Room, enabling your guests to explore the whole Museum in private.